It’s official. I’m a coffee snob. Laura watches Lucy on Tuesday and Thursday mornings, and I steal away to a coffee shop about a half-mile from my house. Now, I don’t do Starbucks anymore (that decision happened well over two years ago) but even local coffee shops have been letting me down! Once you’ve had good coffee (roasted within a week or two) and espresso (expertly poured) you can’t go back. Especially, when a bad latte costs as much as a good one. In fact, it makes me quite mad! But enough with my coffee shop rant. When you spend so much time making food, your standards jump mile-high. Coffee is just one example. I’ve also become particular about meat. Ryan and I are conscious of the processes and additives that go into much of our country’s meat, and because of the often despicably low standards, we do with less. Because quality is much better than quantity (at least in my opinion). So when Parma Ham contacted me about featuring their prosciutto, I was happy to create a recipe. Parma Ham is free of additives and preservatives. Four ingredients go into their meat: Italian pigs, salt, air and time. And I promise you can taste the difference. Yes, you can buy a cheap ham at the grocery store this holiday season (just like you can buy another awful cup of coffee), but if you’re like me, you know that it’s worth it to find that which has been crafted with care. These Parma Egg Cups would be perfect for a holiday brunch. Easy and elegant, they’ll leave you feeling relaxed and your guests feeling impressed. Preheat oven to 400 degrees Fahrenheit. Lightly butter four, 6-ounce ramekins. 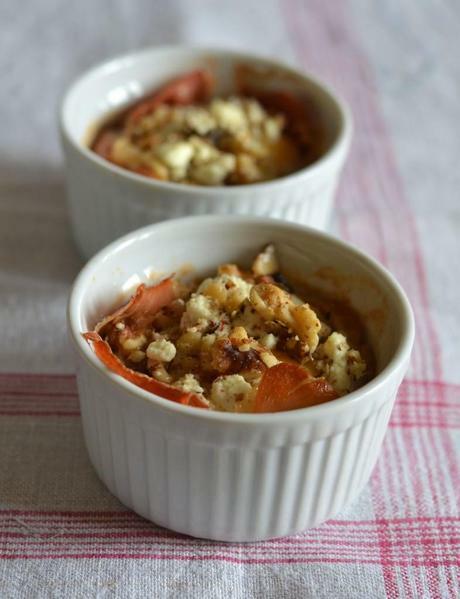 Line each ramekin with slices of Parma Ham. (I used about two slices for each). The parma ham may hang slightly over the sides of the ramekin. Saute mushrooms in olive oil over medium high heat until soft. Gently spoon mushrooms into ham-lined ramekins. Carefully crack an egg into each ramekin, being sure to not break the yolk. (You may want to crack the egg into another bowl and then pour the egg into the ramekin…this ensures your yolks stay intact!). Sprinkle egg with goat cheese and chopped walnuts. 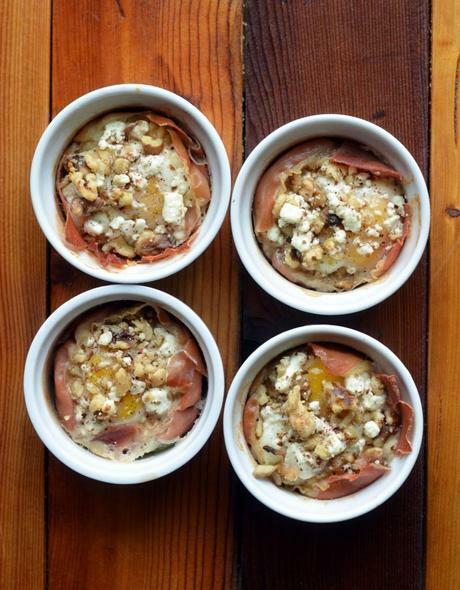 Place ramekins on a baking sheet and bake in preheated oven for 15 minutes or until egg whites are set. If you like your eggs runnier, remove 1-2 minutes earlier. Serve warm.